During my April 29th speech at Toronto's CCIoTBChain Summit, I have discussed SDChain's 4 key commercial applications. What are the 4 key commercial applications? Token Issuance:Very much like Ethereum, an IoT company can easily issue tokens based on SDChain's public blockchain, or Main Net which we brand as SD Matrix, for commercial applications. SDChain's GUIallows the token issuer to utilize SD Cable, made up of REST APIs, to call SD Charger for token issuance. Cost: 0.0001 SDA being utilized as Gas for each transaction, which is significantly cheaper compared to any public blockchain out there. 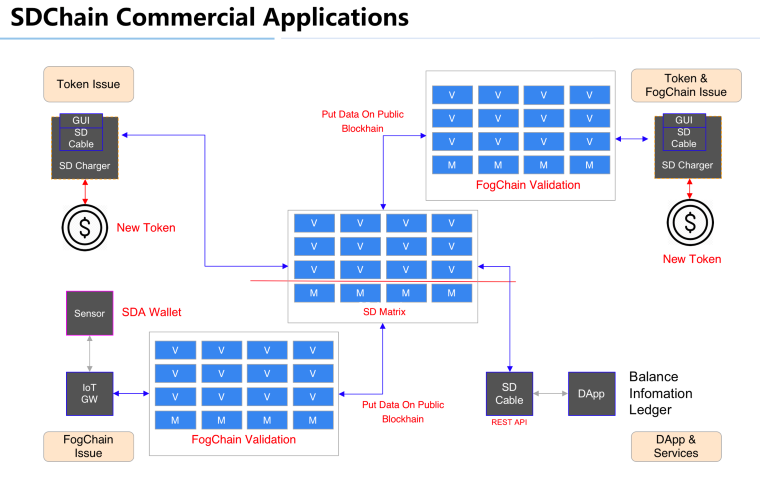 Tokenless FogChain Issuance: Similar to R3's network and other tokenless blockchain networks, an IoT company can issue its own tokenless FogChain connecting to SDChain Matrix, to take advantage of SDChain's open source blockchain technologies. This application is designed to conform with various local governments' policies, namely China's. In the diagram above, a Sensor device embedded with an SDA Wallet has a public address, connecting to an IoT Gateway, that connects to the issuing IoT company's own FogChain. Token & FogChain Issuance: For an IoT company interested to issue its own token AND run its own FogChain connecting to SD Matrix, SDChain makes the endeavour quite effortless. The cross-chain smart contract technology available in SD Matrix, makes it possible for IoT data to flow from Sensor devices, to IoT Gateway, FogChain and ultimately to SD Matrix and vice versa. Further, token-SDA value conversion is also supported. DApp Services:As SDChain is gaining popularity worldwide with IoT and blockchain developers, as well as 3rd party service providers, DApp Services are an easy way for existing application service providers to connect to SD Matrix. Through our easy-to-use REST APIs collectively called SD Cable, a developer can integrate existing innovative services on SDChain. David Pan, CEO, SDChain. May 7th, 2018. GMT+8, 2019-4-19 13:23 , Processed in 1.028167 second(s), 21 queries .